Remember back in April, when Steve Jobs replied to the overblown iPhone LocationGate mini-scandal by saying that it was Google who was tracking users, not Apple? As he often is, looks like Steve is right. 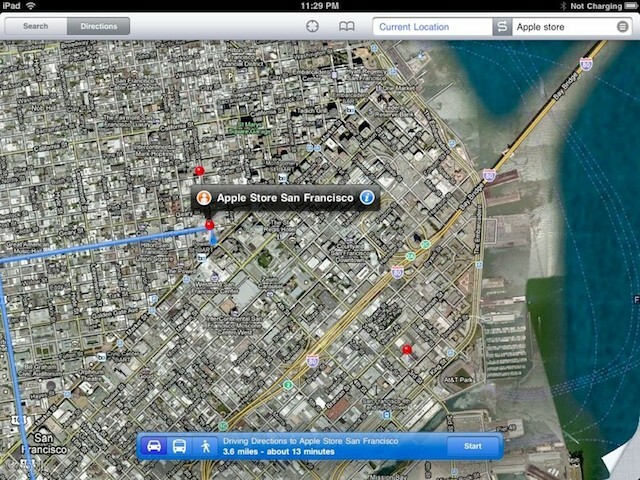 CNet is reporting today that Google Maps can be used to see the approximate location of iPhones, iPads and MacBooks (along with any other connected device) which are connected to a WiFi network. CNet says that unique hardware IDs, or MAC addresses, are periodically sent back to Google when you are using Google Maps. This is all done as part of a mission to create a more intelligent mapping service which could theoretically serve up even greater coverage with finer granularity to end users. None of this is really a problem… except that now, Google and Skyhook Wireless are making their location databases publicly accessible. That means that if someone knows your device’s MAC address, they can use Google Maps to track every location you’ve ever been with a margin of error between 100 and 200 feet. According to Cnet, the problem’s pretty wide scale: they found that they can correspond approximately 10% of all laptops and mobile phones to physical addresses. All it takes is knowing your device’s unique hardware ID. Apple’s so-called iPhone LocationGate was a bug that just left a record of where you’d been with your iPhone on your own computer, if your device backups weren’t encrypted. This seems to be a lot more serious, though: it seems as if Google is actually storing the physical addresses of millions of iPhones and MacBooks across the country. What do you think? Security threat, or overblown? Let us know in the comments.